Ruitao Lv, Gugang Chen, Qing Li, Amber McCreary, Andrés Botello-Méndez, S. V. Morozov, Liangbo Liang, Xavier Declerck, Nestor Perea-López, David A. Cullen, Simin Feng, Ana Laura Elías, Rodolfo Cruz-Silva, Kazunori Fujisawa, Morinobu Endo, Feiyu Kang, Jean-Christophe Charlier, Vincent Meunier, Minghu Pan, Avetik R. Harutyunyan, Konstantin S. Novoselov, and Mauricio Terrones (2015).“Ultrasensitive gas detection of large-area boron-doped graphene”. PNAS, vol. 113, no. 3. Heteroatom doping is an efficient way to modify the chemical and electronic properties of graphene. In particular, boron doping is expected to induce a p-type (boron)-conducting behavior to pristine (nondoped) graphene, which could lead to diverse applications. 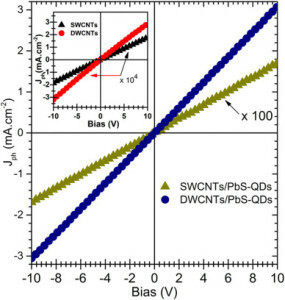 However, the experimental progress on atomic scale visualization and sensing properties of large-area boron-doped graphene (BG) sheets is still very scarce. This work describes the controlled growth of centimeter size, high-crystallinity BG sheets. Scanning tunneling microscopy and spectroscopy are used to visualize the atomic structure and the local density of states around boron dopants. 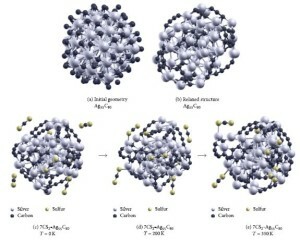 It is confirmed that BG behaves as a p-type conductor and a unique croissant-like feature is frequently observed within the BG lattice, which is caused by the presence of boron-carbon trimers embedded within the hexagonal lattice. More interestingly, it is demonstrated for the first time that BG exhibits unique sensing capabilities when detecting toxic gases, such as NO2 and NH3, being able to detect extremely low concentrations (e.g., parts per trillion, parts per billion). This work envisions that other attractive applications could now be explored based on as-synthesized BG. Josue Ortiz-Medina, Hiroki Kitano, Aaron Morelos-Gomez, Zhipeng Wang, Takumi Araki, Cheon-Soo Kang, Takuya Hayashi, Kenji Takeuchi, Takeyuki Kawaguchi, Akihiko Tanioka, Rodolfo Cruz-Silva, Mauricio Terrones, Morinobu Endo (2016). “Nanostructured carbon-based membranes: nitrogen doping effects on reverse osmosis performance”. NPG Asia Materials, 8, 4, e258. Kazunori Fujisawa, Ibrahima Ka, Vincent Le Borgne, Cheon-Soo Kang, Kensaku Kobayashi, Hiroyuki Muramatsu, Takuya Hayashi, Yoong Ahm Kim, Morinobu Endo, Mauricio Terrones, My Ali El Khakani (2016). “Elucidating the local interfacial structure of highly photoresponsive carbon nanotubes/PbS-QDs based nanohybrids grown by pulsed laser deposition”. Carbon, 96,145-152. Eduardo Gracia-Espino, Bernabé Rebollo-Plata, Hugo Martínez-Gutiérrez, Emilio Muñoz-Sandoval, Florentino López-Urías, Morinobu Endo, Humberto Terrones, Mauricio Terrones (2016). “Temperature Dependence of Sensors Based on Silver-Decorated Nitrogen-Doped Multiwalled Carbon Nanotubes”. Journal of Sensors, 2016, Article ID 4319498. Xin Gan, Ruitao Lv, Junfei Bai, Zexia Zhang, Jinquan Wei, Zheng-Hong Huang, Hongwei Zhu, Feiyu Kang, Mauricio Terrones (2015). 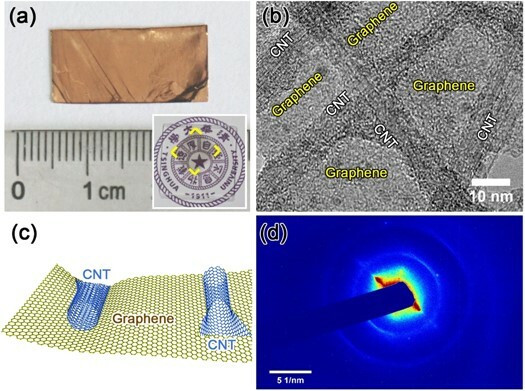 “Efficient photovoltaic conversion of graphene–carbon nanotube hybrid films grown from solid precursors”. 2D Materials, 2, 3, 034003. Zoraida González, Patricia Álvarez, Clara Blanco, Sofía Vega-Díaz, Ferdinando Tristán-López, Lakshmy Pulickal Rajukumar, Rodolfo Cruz-Silva, Ana Laura Elías, Mauricio Terrones, Rosa Menéndez (2015). “The influence of carbon nanotubes characteristics in their performance as positive electrodes in vanadium redox flow batteries”. Sustainable Energy Technologies and Assessments, 9, 105-110.